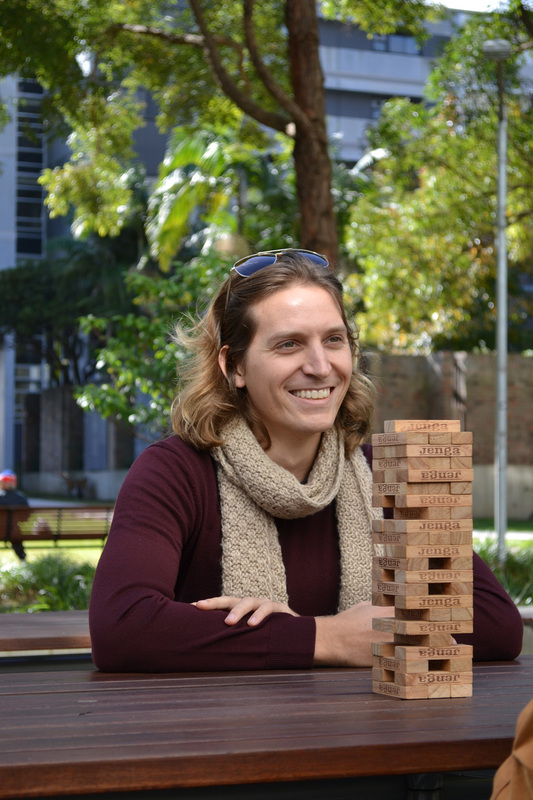 In our new student profile series, UNSW Science had the chance to sit down (read: play Jenga) with Scott Gleason – a UNSW Materials Science and Engineering PhD candidate by day; Pole Dancer by night. 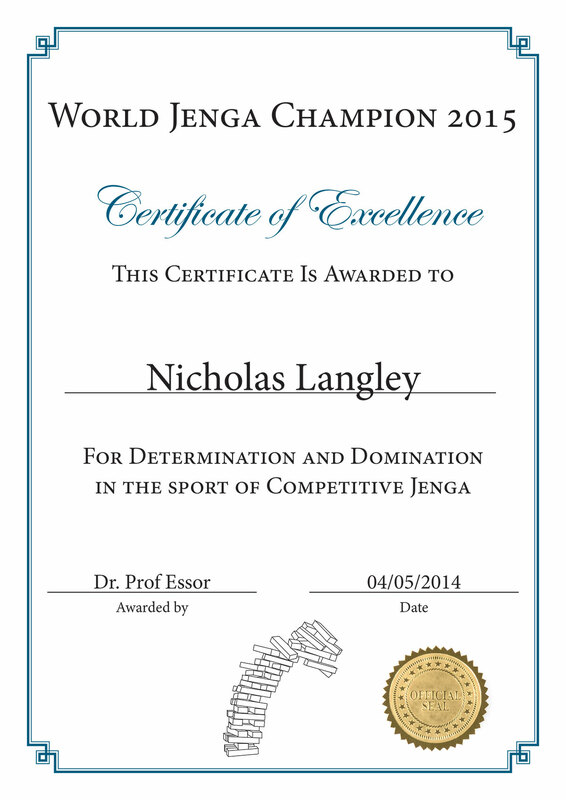 What Nick from UNSW Science, a recent winner of the World Jenga Championship, didn’t account for is the fact that those with a background in Engineering understand how to identify structural weaknesses. It was pretty blindingly obvious that Scott had a skyscraper-sized advantage, yet when asked prior to the game what he thought his chances of winning were, he gave himself a humble 75% (+/- 25%). 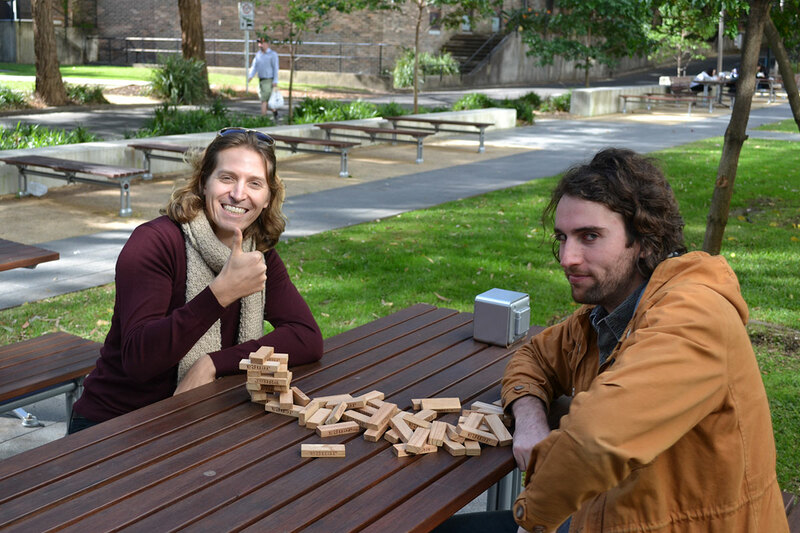 Nick and Scott chatted as they built their increasingly perilous structure, covering everything from Thin Film Metallic Glasses to his upcoming attempt at being crowned Mr Pole Dance Australia. Nick: Hey there, what’s your full name, and where are you from? Scott: My name is Scott Allan Gleason and I’m from USA – specifically South Carolina. I’ve come to Sydney after doing my undergraduate degree in Brisbane. It was a nice campus…but it was Brisbane. Nick: Poor old Brisbane. South Carolina, though? What are they famous for? Nick: That wasn’t all bad, I guess. There aren’t slaves in America anymore. Maybe South Carolina were the heroes 19th century America needed? And now that you’re down in the infinitely superior Sydney, what are you studying? Scott: I’m about a year into my PhD in Materials Science and Engineering. Specifically in Thin Film Metallic Glasses. The project’s just been approved! Nick: So are you revolutionising the way people see, or are you working with sheets of glass? Scott: Metallic glasses are metals that have a structure that are similar to their liquid structure, except it’s in a solid state. So, it’s amorphous, and amorphous materials turn to glass – hence Metallic Glasses. Confusing, I know. Nick: What are the benefits of pursuing and researching these metallic glasses? How can we apply them? Scott: Their structure is completely different to normal solid metal. Their thermal and electrical conductivity is greatly reduced. They’re much stronger…but they’re also inclined to break. At the moment, due to their brittle nature, they can only be used in non-structural applications. They’re using them in power transformers because of their electrical properties. Nick: Why study Materials Science at UNSW? Scott: UNSW has the best Materials program in the country, and it’s in the top 20 globally – so there wasn’t really any choice for me. I wanted the best. Nick: How did a Materials Scientist find himself pole dancing in his spare time? Scott: I went to a friend’s BBQ, and his sister had a pole in the living room, specifically there for pole dancing. After a couple of beers we were invited to have a play – afterwards we all made fun of it of course – and I jumped on it and actually really liked it, so I took up classes afterwards. Nick: Have you found that you’re one of a kind, as a male pole dancer? Scott: There’s quite a few actually. There’s the Mr Pole Dance competition next week, the largest male pole dancing competition in the world. Nick: Are we speaking with the future Mr Pole Dance Australia? What defines a good routine? Scott: Oh, it’s possible. Everybody has a chance though. A good routine needs to be memorable; it needs to have a story. This year I’m a pirate king – dressed as such. Nick: How have all of the other contestants ended up pole dancing? Scott: They’re actually from all over. Some guys come from a dance background, like ballet or breakdancing. There’s a few guys coming over from parkour. Obviously, there’s ex-gymnasts too. Nick: After you finish your PhD are you looking to pursue a role in academia, or are you hoping to keep up the pole dancing too? Scott: Well that’s the good thing about pole dancing: it only happens at night, so I can continue researching by day and dancing at night. Nick: And if you don’t end up going into academia, what do you think you’ll do? Scott: Probably go over to Europe. Europe has more research-type positions, where PhDs are highly valued. I could get into an R&D department, for instance. I’d say Volvo would have a pretty vibrant R&D department. Nick: Aside from pole dancing, what would you say your favourite invention is? Scott: Well I’d have to say YouTube – that came out pretty much exactly 10 years ago. I love it because whenever I don’t know how to do or forget something, there’s always a tutorial. One of my favourites is the Crash Course series: they cut down world history and chemistry lectures into ten minute episodes. Nick: Have you made any tutorials yourself? Scott: I have several pole dancing routines online, entirely for educational purposes. Nick: Would you rather have hands for feet or feet for hands? Scott: I would definitely have hands for feet. I could climb things like crazy. I could do handstands all day. I could probably even handstand while sleeping. Nick: If you could choose one superpower, what would it be? Scott: Being a pole dancer, I’d have to go with Wolverine’s cell regeneration. It’d be nice to heal from any injury instantly. Last year I tore my rotator cuff, right before Mr Pole Dance last year, so it would’ve been nice not having to run through that routine in a fair amount of pain. It was at roughly this point that Scott had backed Nick into a corner, leaving him with 3 blocks in removable positions, yet all three were stubbornly planted within the tower. Nick’s attempt to remove the middle piece from an otherwise empty level – in the hopes of the levels above neatly cascading into place – failed miserably.